I realized super late that I didn’t leave a post for today so I’d thought I’d update you if any of you cared to know but the annual SheepyPeep Birthday Week has come along! Jenn’s 19th birthday was yesterday (crazy times, man — 19 years old!) and my 18th birthday will be in 6 days time on September 3rd! There will be a post about this on my birthday and all about the adventures (I promise that will happen this year Sheepy, I’m going to start it up for the drafts/queue right after this) so be on the look out for that! There will also be an super duper special post on September 1st to commemorate the start of my college career over on at Rutgers so watch out for that as well. Hope you’re all doing well! I’ll catch you next week, promise! At the end of my senior year in high school, I spent my time creating little posters for every single person in my choir program, each adorned with everyone’s name in cute little font and dots and colorful paper. Why did I spend my time making 100+ posters? I don’t know. I love choir and people writing loving messages to one another and spreading positivity and other nice things, but that isn’t the point of this post. My senior year, I was the Student Option for the Beginning Women’s Chorus—a Student Option is basically like a TA (teacher’s assistant)—and so obviously my students wrote on my poster as well as all over my yearbook (all the people who were student options aka 4 of us had to get a second poster haha—so many students!) I was reading over all their comments and I don’t know, my insides just felt all tingly. Is that weird? I’d like to think it isn’t. When you get to read your own students write things like “you inspire me to work hard” or “you’ve taught me to never give up on my dreams” or “you showed me just how much fun music and choir can be” or “I was going to quit choir, but then you showed me how exciting it is”, well you get a little emotional. Because that was me four years ago. Four years ago, my student option inspired me and kept me from quitting choir (well, the plan was to defer for just my sophomore year but obviously that changed) and taught me how exciting the world of music is. Four years later, I find myself in the other shoes and I can’t be any more ecstatic. Obviously yes I love that my students adore me because duh who doesn’t want to be adored (imagine a hair flip happening now! ), but as a teacher, all you could ever want is to see your students grow and learn to be ambitious and find joy in the things you’ve tried to teach them. As a teacher, you give them everything you’ve got, everything you’ve learned, everything you love, just so that they can grow into their own people and find their own way. To know you’ve got a part in something like that, that’s a big enough reward that I’ll be smiling back at the memories for decades. After four long years of hard work and dedication to my high school choir program, my students showed me that none of that work was for nothing. All of that went toward a cause, a small one, but a cause no less. These students got the experience of music education, they were given the opportunity to experience the joy of music, and now they’re willing to fight for that same cause in their journey throughout high school. They too want to ensure that everyone has the right to an education in music and the opportunity to just enjoy music in school. To see the look of excitement for the years to come etched on their faces, I just know that all the time and energy I put in the music department went to something. I didn’t have to do any of that, but I did it anyway. Somewhere in myself I knew I had to and there was not escaping that. I hope that I’ve made their first year a joyous one and that they will strive to do the same for future students in our high school program. I hope that even if they don’t have my exact goals in mind, that they can look back at the times we’ve had and enjoy their time in choir and smile fondly at the memories. I hope they can make the best of friends that I have made in my time there. Students are an immeasurable amount of joy if you’re willing to put your heart and soul towards them. You won’t receive as much gratitude if you don’t give them your all. College is starting up and what are students mainly known for? Being broke! Even though I realize that that is an exaggeration and most college students are not entirely flat out broke, money can be tight when you’re young and new to providing for yourself. So I’ve been reading a bunch of different blogs lately about being budget-friendly and being more organized because I just find those things comforting. But this is also for my fellow collegiate readers who may need the help! You can see that I have a budget-friendly theme going on here and that’s exactly what Thirty Handmade Days promotes. I’m in love with her binder posts that help get you into saving and keeping track of how much you’re actually spending and the fact that she encourages her kids to do the same is great. She has these binders, “School Binders”, “Accountability Binders”, that help her kids grasp the concept of saving money and staying on top of their work at a young age which I think is incredibly smart. She also has a post entitled the 1 Year Savings Challenge that draws out a chart of money to save throughout the entire year and it’s actually really interesting and helpful because through it, the amount you could save could buy you a plane ticket somewhere, which I definitely want haha. I’m rambling and not summarizing very well again, so I’ll just link you two of my favorite posts by her haha. I hope that you’ll check them out and be inspired to be up-to-date with your budget and not overspend when you don’t need to! Also, one of my best friends is moving into his dorm today at the University of the Arts and I will be there to help so that’s where I am today! It’s in Philadelphia, PA so he’ll be about 1-2 hours away and I won’t see him everyday anymore which will be depressing but we’re all going on our future journeys now 😦 To lighten the mood, check out his Soundcloud (I recommend Blame, he made it for his Senior Project in high school)! He’s going to college for Music Production woo! Let me tell you straight up, COLLEGE SCHEDULES ARE NOT FUN. Okay, in the long run it isn’t a complete lie because college schedules are indeed, quite exciting. I received my first fall semester schedule yesterday and I’ve got to be honest, I’m pretty pleased with it! My earliest class is at 10:55am but the downside is that my latest class is 7:20pm… That does not make Hannah a very happy camper. At all. Unfortunately for me, freshman are not allowed to participate in the Add/Drop period until the second day of school and by looking at the Facebook page…I think it’s safe to assume that majority of those people will be trying to fix something. I’ve found an open class that I can switch into but sadly for me, I can only get in through special request. I could quite possibly have special request if I get into a certain choir because it’s rehearsals conflict with that class then I can maybe get put in, but if I don’t play my cards right I may have to get an 8am or 9am class. In retrospect, that isn’t really that bad as my high school required us having 7:15am classes so anything is a welcome change from that but still y’know? We’ll see how that goes. I was supposed to write a book review for Strength In What Remains by Tracy Kidder for today but I did not exactly finish reading that. Haha. I’m in the honors program here at Rutgers so they required us to read this book and participate in an online blog/forum and even though I didn’t finish, I found myself able to participate with the minimum amount of comments I had to add (ah yes, look at the overachiever that I am!). As many lazy people do, I decided not to finish the book as it wasn’t really my cup of tea. But I figure some of you are sick of so many book reviews (I’m sorry, I was on a roll!) I haven’t even written my reviews for Unsouled and Undivided! I loved those book so much, Unwind has probably been one of the best series that I’ve read in a long time. So hopefully I’ll get that back up and running before I get too consumed with class! I recently saw all my little high school friends post their class schedules practically everywhere on social media and wow. It’s such a surreal experience to see them getting their schedules and thinking, “Oh wow, this person’s taking blahblahblah” and “Huh that class is that period cool” but knowing that you’re not a part of any of that anymore. I’ve pretty much figured out when all the choir classes are haha, but I’m not taking any of them which is really strange to me. I feel like I’m so involved in this process because it’s just right in front of my eyes, but I’m really not. Here I am waiting for my own first-year fall semester schedule in college, and I’m still doing my typical high school tracking. Will it ever get easier? Probably when all of those high schoolers get to college and don’t care about showing their class schedules, haha. Not completely sure if I miss high school—I definitely miss some of the teachers and the friends I’ve made and the fun classes that I occasionally took. But does that mean I miss high school? Maybe I miss the simplicity. Not that I’ve started college yet but even I’m smart enough to know that the two simply are not the same. The even more surreal experience is seeing a bunch of your high school friends, some friends that you’ve known for years growing up, move away for their college experience. A friend that I’ve known since kindergarten days is already off at Cornell, an old middle school friend is going all the way to San Diego— we’re meeting up today to catch up before she leaves. It’s all very strange to me. I want to hope that I’ll always be able to keep up with the friends that I want to, but I know that it won’t always be the case and that things will get busy. Our lives will get in the way and other sentimental stuff, right? College is weird. High school is weird. People are weird. Friendships are weird. I’m such a kind soul. I saw this movie the day it came out (I’ll be honest I didn’t even know it was coming out, I’m not a big Mission Impossible fan!) with my parents and my aunt and uncle in North Carolina at a Carmike Cinema. I unfortunately don’t have a ticket stub picture to attach because I don’t think they use ticket stubs there–there wasn’t an attendant to rip ticket stubs like at my usual Regal Cinemas. But you probably don’t want to know about these details and just want to know what I thought of the movie haha. Rogue Nation was obviously very exciting and action packed and very easy for me to follow despite never having seen a Mission Impossible movie, so props to them! I have a note in my phone that says “wow Tom Cruise looks good”, and…yeah…he did. I was surprised because I grew up thinking the Mission Impossible movies were for “old people” because it’s “what my parents watched” blahblahblahblah so I assumed that Tom Cruise was old also, and even though he kind of is, it doesn’t show. Okay never mind about my brief fangirling about Tom Cruise–moving on! Poor Jeremy Renner! Every movie he does, he has such a lack of action, it’s as if Hollywood recognizes his talent and sees him as a great actor but they don’t have him do anything! He isn’t bad, his movies don’t do bad, in fact, they’re good! They just don’t become great if it’s in regards to him. I feel so bad, he’s in such high-class movies all the time, but he doesn’t…do anything. There were a few unnecessary car/motorcycle chase shots where they showed the chase from a first-person perspective and although in retrospect it’s kind of cool and interesting to know what that looks like firsthand, it isn’t central to the plot or the movie and was just an embellishment. An unnecessary embellishment unfortunately. Also why do all the nerdy and lame guys have to wear glasses in these movies or any movie whatsoever, it’s not fair man. As a proud glasses wearer, that is a lame stereotype that needs to be abolished because most people look great if not better with glasses (so long as it’s the right frame for their face y’know). That wasn’t really important regarding this movie but just a minor ranting point from my end, sorry sorry. All in all, it was a really exciting movie and I might just take a look at the other Mission Impossible movies. 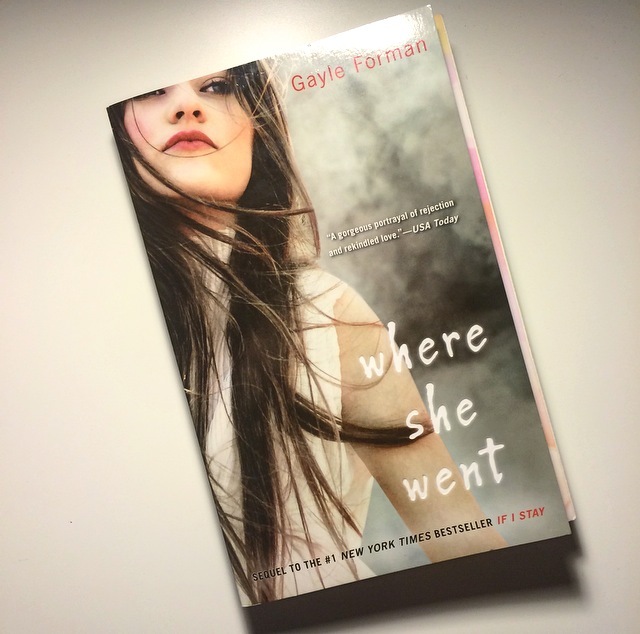 I finished Where She Went by Gayle Forman on July 25 2015 at 1 am (yes one in the morning, I don’t usually do that so you know that I really wanted to go through this book). To be brutally honest, I liked this book so much better than If I Stay, and by looking at Goodreads, most of the raters thought the same thing haha. I think the reason I liked Where She Went more than If I Stay is because of the feel of the timeline. I know it’s very similar to If I Stay but this felt like there was more going on and that there was more to learn and I think that just came from the fact that the plot is three years later so there’s so much to catch up on. It could also just be that I’m a huge sucker for love and I just wanted Mia and Adam to rekindle again, but I’m certain that that isn’t the only case. This is a slightly bitter comment (is it even bitter? probably not but I don’t have a better word for it), but I might have liked it better because I actually got to learn most of the full names of everyone in this book..haha, no that’s not it. I enjoyed that though! I think there was just more going for this book and more finality and more…being in this book rather than just observing the plot through a microscope, which is what If I Stay felt a little bit like to me. I’ve addressed that my imagination can make books feel very real and enveloping to me and I certainly didn’t feel that way with the first book. The first book, I was just reading–it was a nice read definitely, but I wasn’t absorbed. Where She Went on the other hand, that absorbed me completely, I wasn’t just reading the book–I was in the story, if that makes sense. I enjoyed this definitely and would certainly recommend it. I think I read a review that said they read this without having read the first one and got by just fine, and to be honest, I think you probably could. There are some moments in the first that make the second more heart-wrenching but you wouldn’t really be missing much plot as a lot of it is recapped in the second. But it’s a good kind of recap, not the kind that feels repetitive which I know a lot of books from a series do. Just read it, it’ll be great. If it wasn’t a great book I would tell you! Does anyone else get extremely nervous and anxious when they have to make phone calls, especially important phone calls to official people? Yeah, same. Very much same, actually. So, as you can assume, since I’m a college student now, I have to pay my term bill for the semester and upon opening my term bill, I found a random amount of financial aid that I was never awarded. At least, I didn’t think I was awarded it, so I passed it off as a random blessing of money to get myself through college. But as the young Augustus Waters said in The Fault In Our Stars, “the world is not a wish-granting factory.” That was not a random blessing of money. In fact, months ago in June, I was offered a federal direct unsubsidized loan and for those of you who don’t know what that means, basically I was awarded a loan which came with obvious interest that no one wants to pay—so I declined the loan. Well….failure on my part, I didn’t actually decline it, I just ignored it, thinking that that was what I had to do. If I didn’t accept it, that means I declined it right? Wrong. That “random blessing of money”? The loan that I never accepted. According to some thread I found online about this same issue, Rutgers assumed that even though I didn’t accept it, I would later and would just pay it off later. Not the case at all!! No no no!! I looked up what to do about it but I had already paid my term bill last week and it was due yesterday! My attendance is confirmed so I don’t have to worry about my enrollment but money!! Ah!! I tried looking for means of contacting the financial aid office and found no e-mail but a phone number and fax number. To make it even worse, my parents don’t even understand the anxiety and just yell and complain about me being ridiculous very openly in the house. Nothing like the wrath of your parents to make you feel more and more uncomfortable about the situation you’re stuck in! I’ve tried to assemble friends to make the phone call with me but no one is answering or available to come over and help me which obviously makes my anxiety even worse. Why? I don’t know, because when you’re anxious and no one seems to be helping you, your brain makes everything worse for yourself and you just want to explode. So instead of exploding, I came here. Thankfully, this made me feel a lot better about myself. I don’t know that it’s made the inevitability of calling the financial aid office any easier but it’s definitely calmed me down so maybe I can attempt to make the phone call. I apologize if none of this makes any sense and it just sounds like a ramble but sometimes it’s what you need to do to calm yourself down? I won’t be checking it over for mistakes, but when do I ever check over my blog posts. I’m a terrible editor for myself, not that I’m a good editor for anyone else besides spellcheck. I’ve babbled enough, thanks for your time if anyone actually took the time to read through this mess. Hopefully after I publish this post, I will have successfully called the financial aid office and fixed my problems! We’ll see. Thanks again. 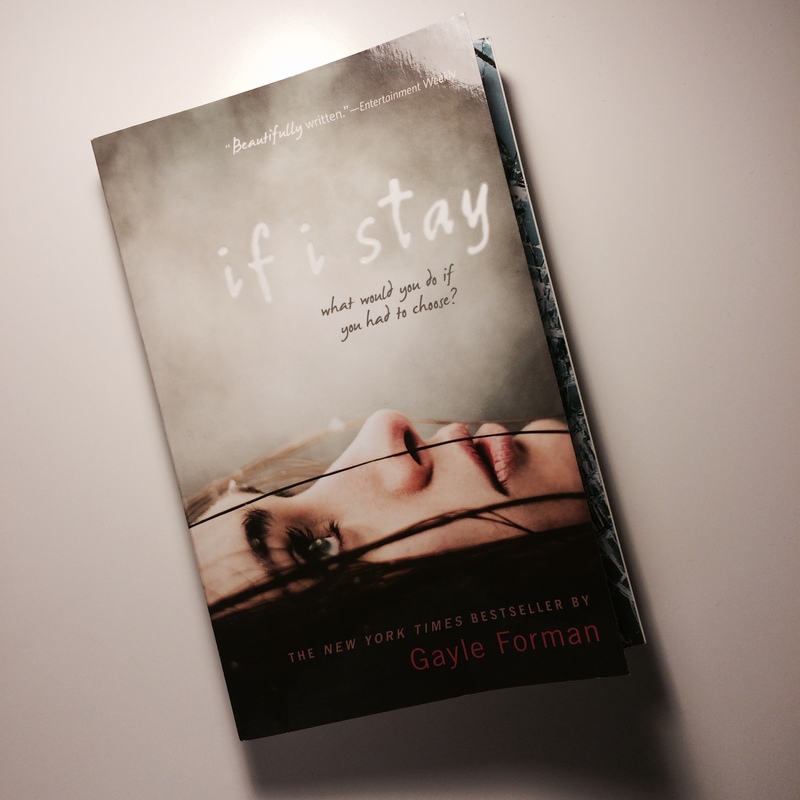 I finished If I Stay by Gayle Forman on July 23 2015 a little before 7 PM. It was a pretty quick read–a little less eventful than I thought it would be, but gripping enough that I couldn’t put it down for too long. This book is strange–I would be reading through it just fine and dandy but I’d pass through 15 pages and feel like I had not gone anywhere. All at once, it feels like a lot is happening but also that nothing is happening. It’s strange. Maybe that’s the whole point of this book, “If I Stay” so it’s just telling you about whether she stayed throughout the whole ordeal…? [SPOILER ALERT: she did]. If I Stay is a nice book though. It’s kind of slow but it’s fast-paced at the same time. Forman knows how to balance the present-day on-goings at the ICU with the background-inducing memories which is pretty admirable since that can be a difficult thing to do. I’m not sure if I would have preferred for the crash to be so early, it felt very, “Ah yes, nice family, nice to meet y—did that just happen…right now? ?” If that makes any sense, because I’m very aware that I don’t usually. I wish I could have learned to love the family before the crash rather than grow to love them and be really sad knowing that they’re gone and that there won’t be anymore to learn about them. Mia always talked about missing her family but I couldn’t sympathize as well because I couldn’t miss them as much as I could have. I of course loved all the talk about music and especially the talk about classical music, it was different but a good different. I loved Gramps too! I wish that I could have learned more about Kim, you learned a lot about Adam along the way. This book would have benefited from explaining everyone else more, I think. I gave it a 4 out of 5 stars on GoodReads if that’s an indication. It’s definitely no Unwind or Fangirl where I’m itching to figure out what comes next, but it holds my attention enough to want to keep reading and know. I’m surprised that I’ve been keeping up with the more than weekly posts, I just randomly decided to try that haha. That’s all I have for now though so I’ll see you guys in the next post!